The intimacy and closeness of these important friend relationships is special3 and examining it here shines a brighter light on teens’ digital friendship practices. In contrast to the analysis in Chapter 1, this portion of the survey involved questions that asked teens to focus on all of the ways in which they spend time and interact with the friend who is closest to them. By stressing these particular relationships, we can focus our participants’ responses on one particular and meaningful tie. 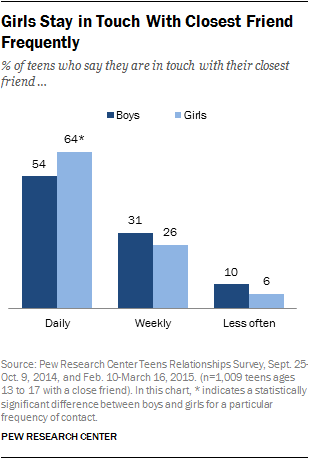 In the context of the survey and the analysis that follows, a teen’s “closest friend” is defined as “someone you can talk to about things that are really important to you, but who is not a girlfriend or boyfriend.” Some 4% of teens in this survey indicated that they do not have anyone in their life who fits this criteria, and an additional 1% were not willing to indicate whether they have a closest friend or not. Therefore, the analysis that follows is based on the 95% of teens who explicitly indicated that they do have someone they consider to be their closest friend. Throughout this chapter, the term “teen” refers to teens with a close friend, unless otherwise noted. In order to gain a broad understanding of the places – including online places – teens spend time with their closest friends, the survey presented nine different venues, activities or locations and asked teens to indicate whether they regularly spend time with their closest friend at each of these venues or activities. Overall, school is by far the top location where teens say they spend time with their closest friends. More than four-in-five teens, (83%), say they spend time with that friend at school on a regular basis. The percentage of teens who spend time with their closest friend at school is largely consistent across a wide range of demographic groups. Other than school, the next most common place to spend time with a best friend is at someone’s house – 58% of teens say they spend time with their closest friend on a regular basis at someone’s house. More than half (55%) of teens say they spend time with their closest friend online, doing things like interacting on social media or playing video games.4 Additionally, 45% say they spend time with their closest friend doing extracurricular activities like sports, clubs or hobbies and a similar 42% say they spend time with their closest friend in a neighborhood setting. Roughly one-quarter (23%) of teens say they spend time with their closest friend at places like a coffee shop, mall or store. About one-in-five teens (21%) say they spend time with each other at a place of worship, 6% said they spend time with their friend at a job and 5% of teens cited another location. Teens from more affluent households are more likely to spend time with their closest friend at someone’s house or engaged in hobbies, sports and clubs outside of school than teens from lower-income families. Fully 61% of teens from households with an annual income of $50,000 or more spend time with their closest friend at someone’s house, compared with 52% of teens from homes with a lower annual income. Moreover, teens from wealthier households are more inclined than those from less affluent households to say they hang out with friends through sports, clubs, hobbies or other activities (48% versus 37%). White teens (65%) are somewhat more likely than blacks (51%) or Hispanics (46%) to say they spend time with their closest friend at someone’s house. Many teens say they “hang out” with their closest friend in online settings, like on social media sites or through gaming websites. Fully 55% of teens spend time with their closest friend online on a regular basis, which is similar to the share of teens who spend time with close friends at someone’s house. Teenage boys are especially likely to spend time online with close friends, as 62% do so regularly, compared with 48% of teen girls. Many (65%) of those who have met a friend online say they spend time with their closest friend on a regular basis online, which is somewhat higher than the 41% of teens who have not met a friend online. While this does not necessarily mean that a teen’s best friend is an online friend, it does suggest a certain comfort with interacting with friends and peers in an online space for this group of teens. Neighborhoods also are a popular place for teens to connect with one another – 42% of teens spend time around a neighborhood with their closest friend. Boys are more likely than girls to spend time with their closest friend in a neighborhood: Nearly half (48%) of teenage boys say this is where they regularly spend time with their closest friend, compared with 36% of girls. Similarly, black teens are more likely than their white and Hispanic counterparts to hang out in a neighborhood. Some 64% of black teens spend time with their closest friend in this type of setting, compared with 41% of Hispanics and 39% of white teens. Roughly one-quarter (23%) of teens regularly spend time with their closest friend at a coffee shop, mall or store. Girls are twice as likely as boys to hang out at these places: 30% of teen girls regularly spend time with their closest friend at a coffee shop, mall or store, compared with only 16% of boys. Teens today have more ways to stay in touch with friends than ever before. Beyond daily interactions at school, teens are increasingly connected by smartphones, social media, gaming, and the internet. These new avenues of communication broaden what it even means to be “friends,” changing how teens connect and how they share with one another. This survey asked teens how often they are in touch with their closest friend through face-to-face contact, phone calls, text messages, or any other digital method. Fully 59% of teens are in touch with their best friend daily, with 41% saying they are in touch many times a day. Another 28% of teens say they are in touch weekly with their closest friend, and just 8% say they communicate less often than that. Girls are especially likely to be in touch with their closest friend on a regular basis. Fully 64% of teen girls say they are in touch with their closest friend daily, including 47% who communicate many times a day. This compares with 54% of boys who stay in touch daily, and 35% who do so multiple times a day. Black teens are less likely than their white and Hispanic peers to communicate daily with their closest friend. Some 40% of black teens do so, compared with 61% of whites and 62% of Hispanic teens. While there were no major differences by age, the economic and educational status of their parents or where they live, teens who have access to certain technologies are particularly likely to be in more frequent contact with their closest friend. Teens who have mobile internet access – whether through a phone, tablet or other mobile device – are significantly more likely than those without this kind of access to be in frequent touch with their closest friend. A full 60% of these teen mobile internet users are in touch daily with their closest friend (including 42% who make contact many times a day). This compares with 47% of those without mobile internet access who communicate daily with their closest friend, including 27% who do so many times a day. Focusing in on smartphone users, teens who have access to a smartphone also are likely to be in daily touch with their closest friend. Some 62% of teens with smartphone access are in touch with their closest friend daily, and 45% are in touch multiple times a day. In contrast, 51% of teens who do not have a smartphone (48% of whom have no access to a cellphone at all) are in daily contact with their closest friend. Social media use also is correlated with more frequent friend interactions. Some 63% of teen social media users are in daily contact with their closest friend, including 44% who are in touch with their best friend multiple times a day. Among teens who do not use social media, 47% are in daily communication with their closest friend, and 30% connect with their closest friend many times a day. Teens who use a large number of social media platforms communicate even more frequently. Fully 78% of teens who use five or more social media sites say they are in touch with their closest friend daily, and about two-thirds say they are in touch many times a day. Teens today have a number of ways to get in touch with each other, and they use them in various combinations. Some methods, however, are more favored than others. This survey asked teens about their preferred modes of digital communication with their closest friend – the first, second, and third most common way they get in touch online or on their phones. Text messaging is the dominant form of digital communication among teens. 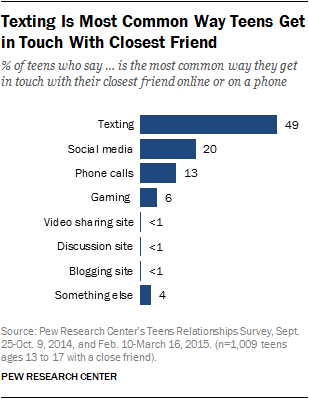 Some 49% of all teens say text messaging is the most common way they get in touch with their closest friend. Following general texting patterns, teen girls are significantly more likely than teen boys to say texting is their first choice for getting in touch with their closest friend. Some 55% of girls say so, compared with 43% of boys. Older teens are also particularly likely to use texting as their primary means of getting in touch with a friend. Fully 54% of teens ages 15 to 17 say texting is the most common way they communicate with their closest friend, compared with 41% of teens ages 13 to 14. Teens who live in relatively affluent households tend to rely more heavily on texting as a primary means of communication, while teens in lower-income households tend to say social media is how they stay in touch.5 Teens who live in households with an annual income of $75,000 or more are the most likely to say texting is the most common way they get in touch with their closest friend – fully 58% say so compared with 41% of teens in households with an annual income less than $75,000. Teens who live in households with the lowest annual income – $30,000 or less – are more likely than many wealthier teens to say social media is the most common way they get in touch with their closest friend. A third of teens in this group say so, compared with 16% of those in households with an annual income of $50,000 or more. Further, the 33% of low-income teens who say social media is the most common way they stay in touch is statistically similar to the 35% who say texting is their preferred method of communication. Black and Hispanic youth are also more likely to say social media is the most common way they get in touch with their closest friend. Some 32% of black teens and 30% of Hispanic teens use social media as their primary communication method, both significantly higher than the 14% of whites who do so. Teens with access to personal technology text their closest friend, while those without it use phone calls or social media to stay in touch. Smartphone owners notably differ from those with a basic phone or no phone. Teens who access the internet via mobile devices such as smartphones or tablets are more likely to say texting is the most common way they get in touch with their closest friend. Some 52% of teen mobile internet users say this, compared with 15% of those without access. This reflects the higher rates of smartphone access among teen mobile internet users – 78% say they have or have access to a smartphone, compared with 9% of non-users. In turn, teens who have access to a smartphone are more likely to say texting is the most common way they get in touch with their closest friend. This is true of 58% of teens with smartphone access, compared with 30% of teens who only have access to a basic cellphone, and 19% who do not have access to a cellphone at all. Teens without access to a smartphone are more likely to say social media is the most common way they get in touch with their closest friend. Some 29% of teens without smartphone access say so, including 23% who only have access to a basic cellphone, and 37% who do not have access to any type of cellphone. 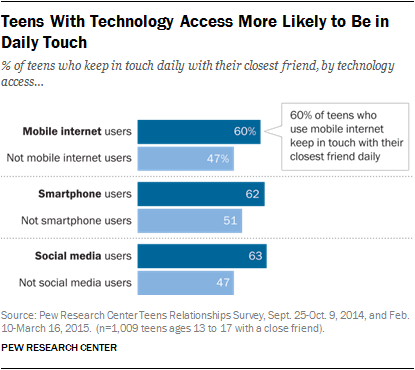 This compares with 17% of teens with smartphone access. Teens without access to a smartphone are also more likely to say phone calls are the most common way they get in touch with their closest friend. Some 21% of teens without smartphone access say so, including 22% of teens who only have access to basic phones, and 19% of teens who do not have access to any type of cellphone. Just 10% of teens with smartphone access say phone calls are the primary way they get in touch with their closest friend. Looking at the overall picture – combining answers to the first, second and third most common ways teens get in touch with their closest friend – texting comes out on top. Some 80% of teens say they use this as one of the three most common ways they get in touch. But phone calls – a technology from the analog era – are the second most popular method overall, with 69% of teens citing it as one of their choices. This is followed closely by the 66% of teens who say social media is in their top three preferences, while just 21% of teens noted gaming in any of their choices. Other communication methods, like video sharing, blogging and discussion sites were cited by 10% of teens or less. Some 21% of teens, however, said “something else” to any of the three most common ways they get in touch with their closest friend. Write-in answers reveal that some teens use video chatting, like the popular iPhone service FaceTime, to get in touch with one another, as well as email. 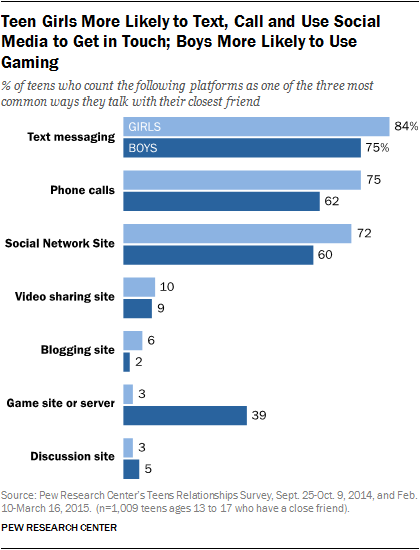 Girls are more likely to say they use texting, phone calls and social media as any of their three most common ways to get in touch with their closest friend. Some 84% of teen girls say texting is one of their preferred methods, while 75% say they use phone calls and 72% use social media. This compares to 75% of boys who text, 62% who make phone calls, and 60% who use social media. 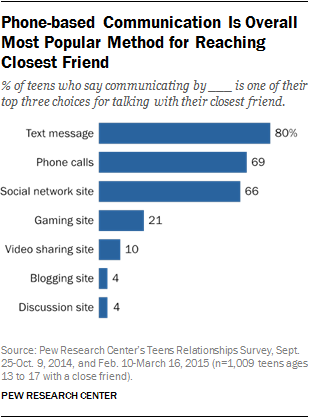 Teen boys, however, are more likely to note gaming among their top three methods of communication with close friends – 39% vs. only 3% of teen girls. Black teens are more likely than their white and Hispanic peers to say phone calls are one of their three preferred methods of getting in touch with close friends. Some 84% of black teens say so, compared with 69% of whites, and 63% of Hispanic teens. Teens who live in households with an annual income of $75,000 or higher are more likely than teens in lower-income households to say texting is one of the three most common ways they stay in touch with a close friend. This is true of 85% of teens from the most affluent households, compared with 71% of teens from households with annual incomes of less than $50,000. Teens who have access to smartphones are more likely to note texting, phone calls and social media among the top three ways they prefer to get in touch with their closest friend. Some 86% of teens with smartphone access say texting is one of their top three ways, compared with 62% who do not have access to a smartphone. Some 71% of teens with smartphones make phones calls, a significant difference compared with the 62% of teens without smartphone access. Finally, some 68% of teens with access to a smartphone use social media to get in touch with a close friend, compared with 60% of teens without smartphone access. Teens without smartphones are more likely to report that they use “something else” to communicate with friends. In the open-ended response to this question, teens without smartphones notably told us that they used video chat platforms like Skype and FaceTime, as well as email, as some of their top ways to stay in touch with their best friend.